We’ve got just about nine days left in Florida before we head west. Our next stop is five days camped at Disney World, and then up to Green Cove Springs for a night or two to conclude business there, and then we head west. Between Green Cove Springs FL and Tucson AZ are about 2,000 miles of interstate highway. It’s a route we’ve driven many times, and we’ve always had a good time stopping at the Florida panhandle beaches, New Orleans, Austin & the Texas hill country, Big Bend, and the southern New Mexico state parks. It would be easy to re-trace our usual route but I view each trip as an opportunity to explore something new, so I’m looking for nominations from you — our blog readers — of things we should see/do/explore/hike/snorkel/photograph/eat/cook/play along the general path of Interstate 10 through Florida, Louisiana, Texas, and New Mexico. That’s 2,000 miles of great American country, so don’t act as if there’s “nothing to do”! Tell me what you recommend. Should we take in some white sand in Florida’s panhandle, or investigate the status of the oil spill at the national seashores of Mississippi? Camp in the newest state park in Louisiana, or drop in on New Orleans for some beignets and chicory coffee at midnight at Cafe Du Monde? 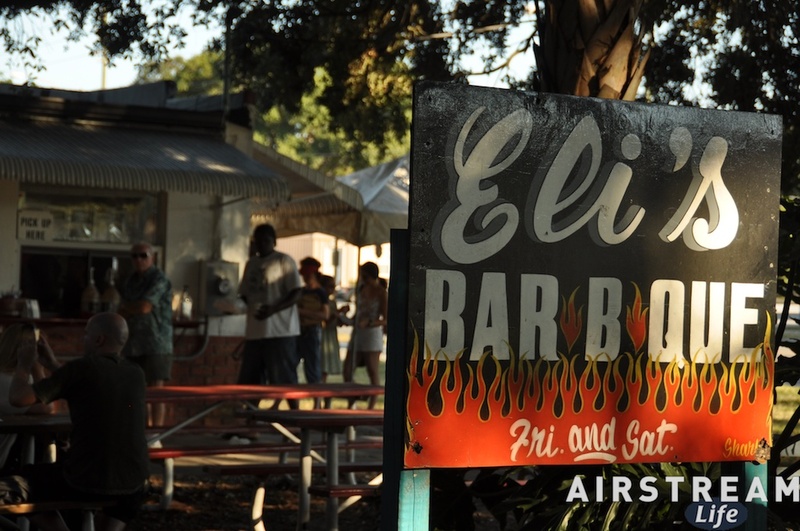 Park on the beach in Corpus Christi, or chow down on the Texas Barbecue Trail? Walk through the Caverns of Sonora, or Carlsbad Caverns? The good news is that we have such great choices. Also, I have no business obligations or appointments along the way (although they have a tendency to pop up). We can set our own schedule for the home stretch, as long as we get back by our “hard stop” date of November 26. You might be thinking, “Three weeks? That’s a lot of time!” but it’s amazing how quickly three weeks vanishes. Given that we rarely drive more than 300 miles in a day, and usually less, we have to budget 8-11 days just for driving. That leaves 9-12 full days for exploring, plus fractions of days left over after towing. A really good destination stop like Big Bend takes a minimum of 3 days not counting travel days. Likewise for an interesting city where we have friends, like Austin or New Orleans. Just two major stops takes up at least six of our 9-12 full days. That doesn’t leave much room for other stops. So we’ve got to be careful about our choices, and especially any detours from the general I-10 route. In the past we’ve tried to rush through a bunch of stops, carving down places that would normally take several days to just a quick overnight, and it’s very unsatisfying. It’s better to have a good stop at a few places than a lot of rushed pauses. If you make a suggestion and we don’t take it, don’t take it personally. We really can only do a few things on the way back and there’s a lot of country to cover, but that’s all the more reason to consider our options and make the most of what time we have left on this great journey. 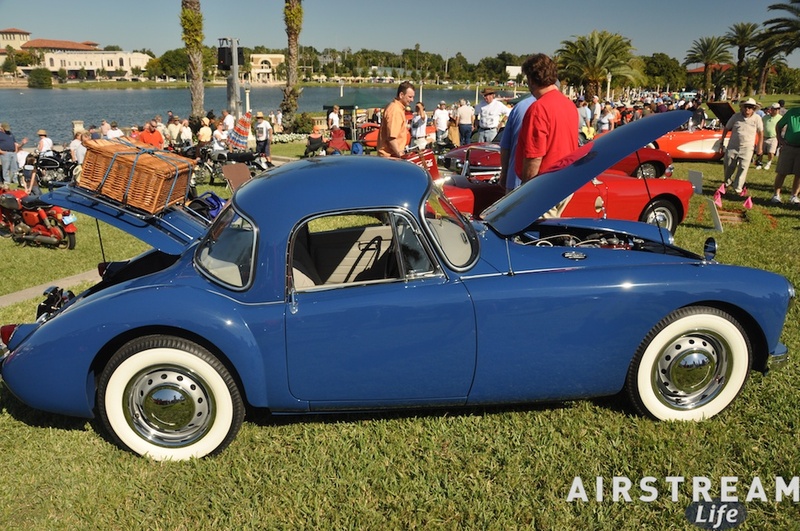 Now, as much as I have been talking about finding new experiences in the Tampa area, there are a few favorite spots that we are virtually obliged to visit. One of them is the Sponge Dock section of Tarpon Springs, a Greek neighborhood just a mile or so off US Rt 19. The main drag of this tourist district, Dodecanese Blvd, runs along a waterway, so that the boats are docked right along the sidewalk just like the cars parallel-parked on the street. You can catch a dolphin-watching cruise almost anytime, as well as buy a LOT of sponges, strappy gold-lame sandals, and excellent Greek bakery goods. We go for the food. Brett and Lisa joined us (Brett took the pictures). We haven’t been here since 2006, but nothing seems to have changed. The big shot in town is still Hellas Restaurant. The Sponge Museum is still showing the same free movie. The signs in town are still misspelled (“WATER VEIW”). Even the boats anchored along the water seem to be in the same places — I wonder if some of them ever move? Our first stop is always the National Bakery, down a side street. Eleanor likes to buy a gallon of olive oil there, plus whatever’s fresh in the bakery case. That gallon of oil will last her for months. Then we browse the street for a couple of hours, and eventually end up having dinner around sunset at one of the Greek restaurants in town. This time we hit Plaka, which is downscale from Hellas but has great food. 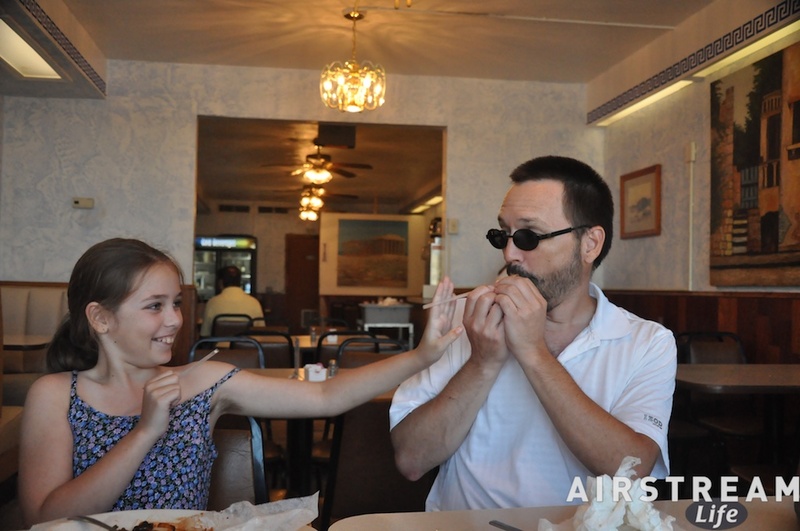 The casual aspect is probably was why I felt able to teach Emma how to shoot a spitball there. The restaurant used to advertise themselves as “The Greek Answer To McDonald’s” but that sign is gone now. Just as well, I think. That wasn’t really the best advertisement for them. Hellas still got our dollar, however, since we went there after dinner to raid their long glass dessert case. As always, it was a tough choice so we all got something different and shared, plus we brought home a few coconut macaroons, almond cookies, and other goodies. You can’t say there’s a lot of excitement at the Sponge Docks, but there is something relaxing about the apparent timelessness of the place. How many other interesting places can you find unchanged after four years? If you live there and pine for something new, it’s boring, but if you only visit once every few years, being frozen in time is a novelty. Florida is so flat they have to make hills on the bike trails. Despite the unusual heat this late in October, it has been good bicycling weather in the mornings. 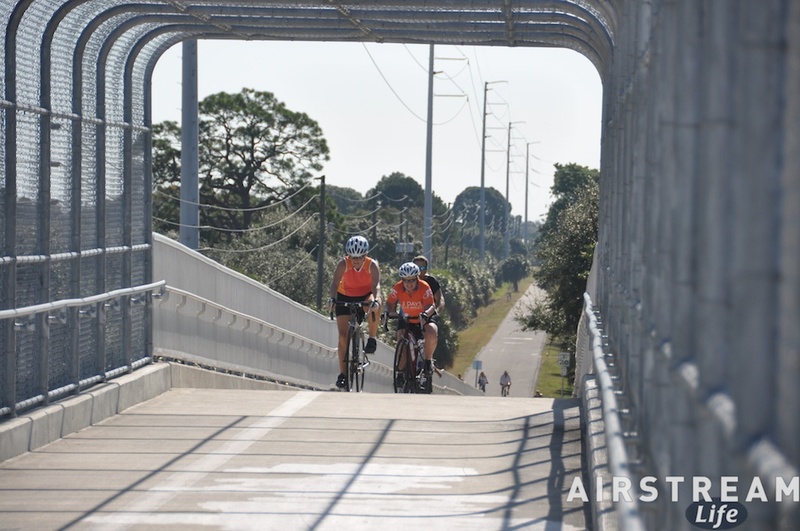 Florida has a nice network of rail-trails statewide, especially around Tampa. So on Sunday morning Brett came over to the Airstream with two bikes strapped to the back of his Rover and we went out to cycle a chunk of the Pinellas Trail before the heat set in. The trail roughly follows the coast north-south, past parks and backyards that once were only seen by freight trains hauling phosphate. A little further south the scenery is best described as “urban landscape,” not necessarily pretty, but interesting in its own way. We cycled about eight or nine miles south from Clearwater, and then back before it got too hot. Along the route we discovered a very nice KOA, tucked up against the water in a quiet secluded location, directly adjacent to the bike path. It was one of those uber-KOAs, “President’s Club Award Winner,” with the cleanest and best facilities, and I briefly considered it as an alternative spot for us on our next visit to Tampa. But then I saw the price — $62 – 84 per night (including the $4 extra for our child) — and decided we had it pretty good where we were. That’s about what we’ll pay for our nights at Disney’s Ft. Wilderness, and although this KOA appeared to be excellent, it wasn’t Ft. Wilderness. Our evening was spent at a unique local event, “Zoo Boo” at Lowry Park Zoo. This time of year the zoo has a series of haunted houses open on the weekends from 7 pm to 10 pm. Each house is rated from 1 skull to 7 skulls. Emma had never been to a haunted house before, and was a little cautious about the concept, but game for a try. We launched right into a 7-skull house at the outside, which Emma got about 20 feet into before retreating. For the rest of the evening she was at the 5-skull level or below. The rest of the adults (four of us) went into every house and loved them, the scarier the better. It was hot again that evening, so Eleanor, Emma, and I piled into a single log “flume ride” car and caused a devastating tsunami that completely drenched us. We were not hot for the rest of the evening, as we squinched our way through the rest of the park … and once again I was glad we had vinyl (ahem, “MB-Tex”) seats in the car for the soggy butts that rode home that night after the park closed. Once in a while I’m reminded that although we are out on a long trip (seven months!) we aren’t really full-timers any more. And there is a difference. Any deadline, even one far away, affects your thinking. When we were full-timers, we could slowly wander along with little concern for distance because we were always home and never getting “too far away”. But now we are part-timers, and we have a schedule. We need to get back to Tucson by the end of November, and we need to watch the mileage and the budget more carefully. Every stop on our tour has to be justified in some way, because the meandering path we took so blithely before now looks more like a series of needless and expensive detours. Our plans, made way back in the spring, included a wedding in Ft Myers FL at the end of October. This is what we call “a hard stop,” meaning that there’s no flex in the date or the location. So we built a few other destination plans around this hard stop, including a very hard-to-get reservation at Long Key State Park. Since then, the wedding has been moved and delayed, and we no longer have a reason to go to southern Florida, except for this reservation. I kept it because it’s so hard to get a campground space in any of the Florida Keys state parks, and because we haven’t been to the Keys in about three years. I like it there. But now, facing a 300+ mile trip (one way) down to Long Key, I am thinking twice about the reasonableness of this detour. The reservation is for only three nights. It can’t be extended or changed because all of the campgrounds are booked. Those three nights will cost us $129 in campground and reservation fees, plus about $140 in diesel fuel, plus wear-and-tear costs of the car (another $60) — in total, about $110 per night for our little 3-night stay. But forgoing our reservation leaves us few options. 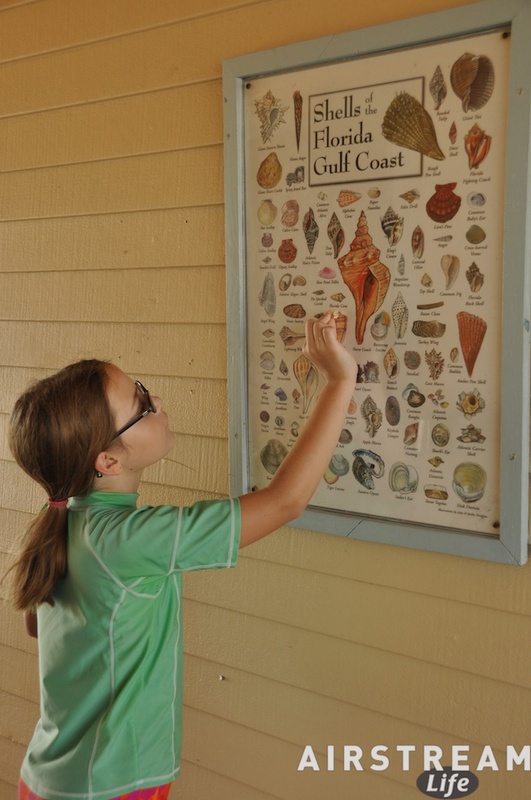 It’s peak season in Florida and all of the good state parks are booked solid every weekend. We really want to get some beach time, go snorkeling, watch the palm trees sway, and have a family picnic while watching the blue water and white sand. But we also need to be back in central Florida in 11 days because we have reservations at Disney World. (See why I HATE reservations?) So if we are skipping the Keys to save the mileage, it doesn’t make sense to go somewhere else that’s more than 100 miles away from central Florida. That kills the option of places like Sanibel Island, or Ft Myers Beach. This is the classic “tough choice.” Options are limited and nothing seems ideal. Fortunately we are courtesy-parked with our friends Bill & Wendimere in central Florida right now, and they have extended the welcome mat for as long as we wish to stay. This has given us a few days to think carefully before we make our next move. After pondering, we’ve pulled out an old standby: a campground near Tampa that we have used extensively in the past and which is reasonably near a lot of things we like to do. 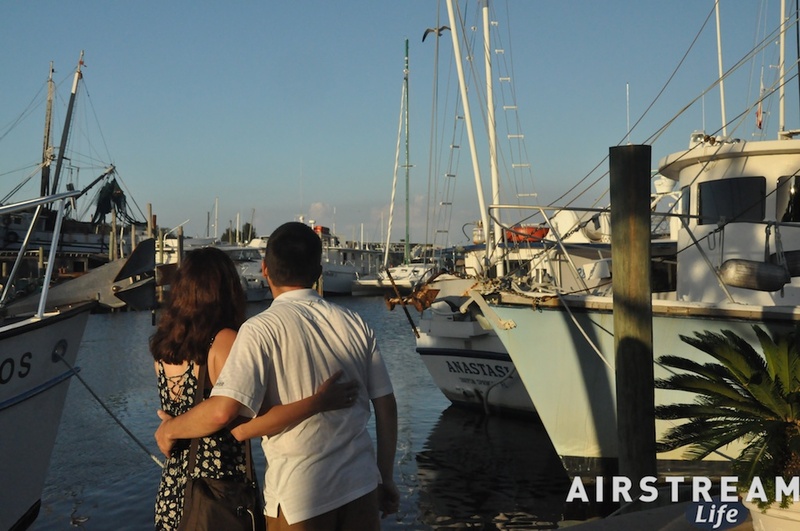 We’ll relocate there tomorrow, and settle into 11 days of comfortable full-hookup life, albeit at a very high price. 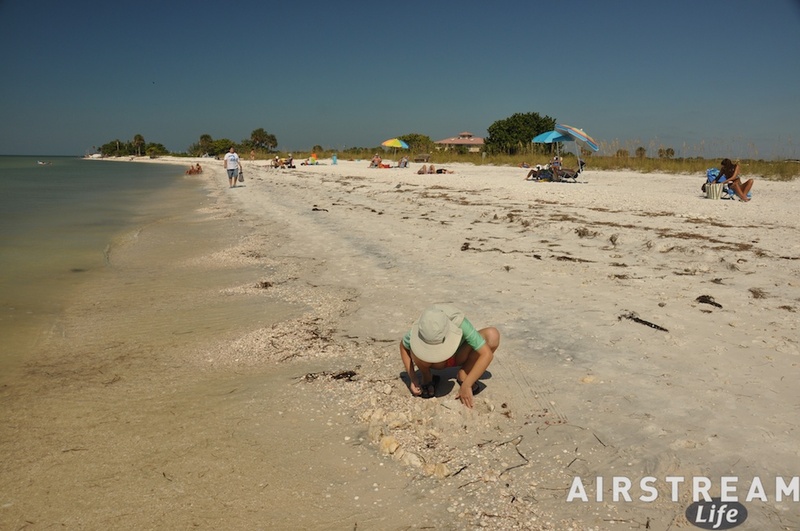 Instead of snorkeling off the Keys, I’ll make-believe by snorkeling off Caladesi Island or Honeymoon Island State Parks, which are just offshore in the Gulf of Mexico near Tampa. Our reservation at Long Key hasn’t been canceled yet. I have until Friday to do that with only a $17 penalty. So, if anyone reading the blog this week wants to snag it, just let me know before Friday and you can have it for $110. I doubt we’ll find anyone but I would feel remiss if I didn’t make the offer, since sites are so hard to get there.